I don’t often pull the “you really need to use a specific brand” card here. Today, I’m laying that card squarely on the table. Because while most of the time I find that attitude to be rather condescending…not that I’m naming names Martha or Ina…it is true that the quality of your ingredients effects your final results. Especially when you are making a dish that has a small number of ingredients, you notice things. Like when the butter you use for shortbread is boringly blah. 99.99% of the time, when I reach for a stick of butter, I’m grabbing Land o’ Lakes or the store brand, whichever happened to be on sale. Usually that’s ok because butter doesn’t typically play a prominent role in my cooking. If my cooking were the first Harry Potter movie, butter would have played the role of Diagon Alley Boy. It’s because butter is usually a minor supporting cast member that every so often I get to pull out the really good stuff and let it be the star. Because you know even Diagon Alley Boy’s understudy aspires to play the role of Severus Snape. So when a recipe calls for Butter (with a capital B), I pull out my special stash of Kerrygold. It is richer, creamier, and more buttery than the pale yellow sticks of butter (lowercase b) that get most of the action in my kitchen. Yes, you might have to look a little harder in your grocery store to find it, but I bet you it’s there. And if you’ve gone to the trouble of putting one block of it in your cart, why don’t you go ahead and just get a few more? Once you taste what the folks at Kerrygold wrap in that gold foil, you’re going to want to find more reasons to pull out the good stuff. I suggest you start with Kerrygold Shortbread. Served with a dollop of Lemon Sauce, Blueberry Jam, or a combination of the two, it is buttery perfection, minimalist style. BAH Note: I think I should have popped the uncooked shortbread into the refrigerator for 30 minutes before baking. When I removed it from the oven, I had a noticeable amount of butter leakage on my sheet pan which is a pretty good indication that my dough was too warm when it went into the oven. It didn’t make the shortbread any less enjoyable; it just meant the bottom of my tart pan was icky. When you score the dough, go a little deeper than you think you need to. The dough will puff in the oven which tends to obliterate light score marks. Line a sheet pan with parchment or aluminum foil and set aside. Place the flour, cornstarch and salt in the work bowl of a standing mixer fitted with the paddle attachment. Mix on low speed for about 30 seconds to combine then add 1/2 cup of the sugar and continue to mix for another 30 seconds. Add the cubed cold butter and continue mixing for about 2 minutes or until crumbs form and there is no loose flour in the bowl. Add in the vanilla and continue to mix for about 30 seconds until the dough pulls away from the side of the bowl in large clumps. Transfer the dough to a 9 inch tart pan with removable bottom. Use your hands to press the dough into the pan as evenly as possible to a thickness of 1/2 inch. Smooth the top of the dough with a plastic bench scraper or thin metal spatula then use the scraper or a sharp knife to score the dough into 12 wedges. Use a fork to dock the dough every 2 inches and sprinkle the remaining 2 tablespoons of sugar over the top of the dough. Refrigerate the dough at this point for 30 minutes to let it firm back up before baking. When you put the dough in the refrigerator, heat your oven to 300 degrees. When ready to bake, place the tart pan on the prepared sheet pan and bake for approximately 1 hour or until the top is lightly golden brown. Immediately use a sharp knife to cut completely through the score lines. Allow the the shortbread to cool completely in the pan before removing the bottom and separating the cookies into wedges. Store in an airtight container. Oh. Yes. Just yes, please! I can just taste these now & I can attest to the Butter with a capital B flavor you get from KerryGold. I have found that one of my local grocery stores stashes the KerryGold in the cheese area. Jennifer, I now have dreams about this shortbread. It’s that freaking good. Of course, having just tried on bathing suits over the weekend, shortbread and I won’t be seeing each other for a while. you are speaking HP and i love that. sigh. this makes such a lovely picture… i bet it is so wonderful with AM coffee or PM tea, a side bowl of fruit. Lan, did you ever imagine that I would be able to combine HP and Butter in a post? If I weren’t trying to ditch the 10 pounds that have stalked me over the last year I would make this on a regular basis. Mmmmm. 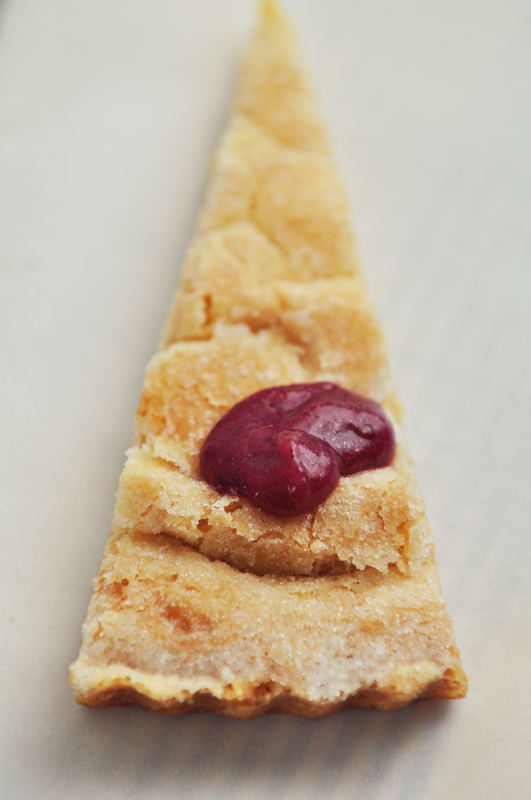 Jam on shortbread. Mmmmm. Tons of mmmmmmmmmmmm Brooke. Tons. You needs. Simply divine…absolutely is. I couldn’t even imagine making this with anything but Kerrygold. I love that I can see your shortbread’s texture in that picture. I have never used Kerrygold butter, so I appreciate this tip. Now I’m curious to see if my local grocery store stocks it. You could not have said it butter…I mean better. I keep the regular stash and then there is the Kerrygold stash. When butter is the star; it deserves an Oscar! I totally agree Barbara. You’re going to make this shortbread, right? It looks so lovely! Wish I could get Kerrygold around here! Tracy, I think it is a crime that you cannot experience Kerrygold. Carrie, if that Butter is on sale, you need to stock up. And maybe send me a pound or two?